VFL: Round 19 win in 60 seconds Get a snapshot of the VFL Magpies' 72-point win over Richmond in 60 seconds with Collingwood Media. 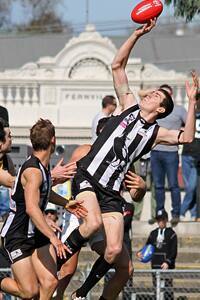 Mason Cox kicked Collingwood's last five goals in a standout display at Victoria Park. Photo: Shane Barrie. Five second half goals to American Mason Cox has propelled the VFL Magpies to a convincing 72-point victory over Richmond at Victoria Park. With Collingwood already establishing a 40-point lead at half time, Cox kicked the final goal of the third quarter before adding all four of his side’s final quarter majors. “To kick five goals in any game of footy is a really good effort,” coach Dale Tapping told Collingwood Media post game. With the services of Jarrod Witts in the ruck allowing Cox to spend time up forward, the American combined with a pair of VFL-listed talls to lead Collingwood’s goalkicking. In a game reminiscent of the Magpies round 14 victory over Frankston, Ash Close kicked three goals for the Magpies, while Ben Monkhorst also added three. In more promising signs, AFL players Witts, Jesse White and Adam Oxley all kicked multiple goals as the VFL Magpies kicked their highest score of the 2015 season. On a Victoria Park surface bathed in sunshine, Collingwood were dominant, albeit inaccurate, in front of goal in the opening quarter of proceedings. They kicked 7.7 in the first quarter, before allowing Richmond to kick two late goals to cut the quarter time margin back to 23 points. “We started really, really well,” Tapping reflected. As Collingwood kicked further in front, it became glaringly clear that this result would not feature the same frantic finish as when the two sides previously clashed in round five. Tapping believes a change in personale and structure allowed the Magpies to this time get the better of their opponents in yellow and black. “We had a really young midfield (in round five). Today we had a bit more experience in our team and structurally were a little bit different,” he said. One of these experienced heads was veteran Clinton Young. After a month of standout performances, Young was named Collingwood’s best player for a game which included 20 disposals at a remarkable 90 per cent efficiency. Ben Kennedy once again staked his claim for senior selection with 35 disposals, while Paul Seedsman’s explosive run and carry was eye-catching in his 30-possession game. Tapping also took the opportunity post match to highlight the impressive performance of debutant Jackson Viola. “We’ve been trying to get him in for the last four or five weeks,” Tapping said of the 19-year-old from Hoppers Crossing. With just one round remaining in the season, jostling for position in the top half of the VFL ladder is reaching a fever point. While chances of a top four position appear slim, Saturday’s comfortable win moves Collingwood up one position to sixth spot, with seventh-placed Werribee still to play on Sunday. Port Melbourne stands as the VFL Magpies final hurdle of the Home and Away season, with a 1pm start at Victoria Park next Saturday acting as the final rehearsal before an exciting finals series.